The Canadian Air and Space Museum used to be right in downtown Toronto. Back when we went, we said it was one of two great airplane museums in and around Toronto. The other is the Canadian Warplane Heritage Museum. We went to Toronto back in 1999 to fly in a Lockheed 10... so no, this plane isn't part of the museum. 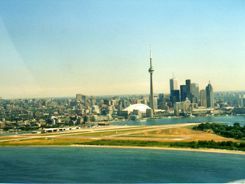 We had a great sightseeing flight out of Toronto's Island Airport.... which is a great aviation experience all by itself. We had to take a little ferry to the airport. From the air, we could see the Museum (formerly the Toronto Aerospace Museum) down the waterfront. This Canadian Museum was a "newcomer" on the aviation museum scene when we visited. It was founded in 1997, and there wasn't much to see. In 2011 the Museum found out its lease was terminated, and it has been looking for a new home ever since. Last we heard they may have found it. Check their website (below) for current news. There is a terrific Canadian Aviation and Space Museum in Ottawa. Don't confuse the two. Ahhh... This is a little different because the museum is really a virtual museum at the moment... it's a museum with no physical home! The Canadian Air & Space Museum has always prided itself on telling the distinctly Canadian stories of aviation, military, and aerospace science... but it's hard to do that with no real museum! The building was historical in itself. It was the original 1929 home of de Havilland Aircraft of Canada. The site contains the oldest surviving aircraft factory in Canada, and it's the birthplace of Beaver and Otter bush planes. The field used to be Toronto's air force base. Their collection was a little light, but they always have had plans to grow. 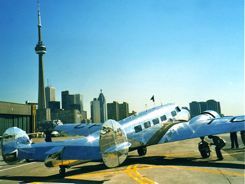 Their collection includes a couple of de Havilland planes and a Lancaster which was taken from its "airplane on a stick" display status in downtown Toronto and is under restoration. After being evicted in 2011, they packed their collection of planes and displays into freight containers. They are currently trying to reach an agreement with the Greater Toronto Airports Authority to secure a home at Lester B. Pearson International Airport... Canada's biggest airport. That airport is where Victory Aircraft Limited manufactured the giant Avro Lancaster Mk. X bomber during the Second World War. It would be great if they could relocate there and get their Lancaster restored and on exhibit. Check their website for the latest on how the Canadian Air and Space Museum is doing with their efforts to relocate.